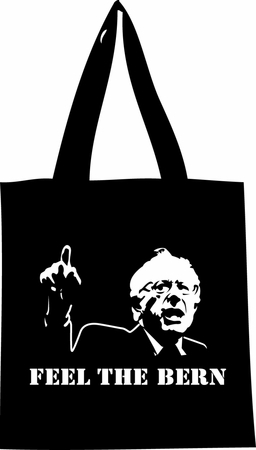 Promote Bernie's campaign with this thought provoking, powerful tote bag to carry your belongings while you're on the go!!!! Go shopping or carry your books, tablet or laptop with this bag and send a message that needs to be heard! Great for carrying campaign materials while your canvasing! When you buy from Progressive Rags you are supporting Bernie's campaign, Jack Lieberman, the owner of Progressive Rags and a well known South Florida political activist, has pledged to give the proceeds he receives from our selling Bernie's campaign materials to help build support for Bernie's campaign. So please buy a shirt, button or a bumper sticker and start campaigning today!